This novella is what I’d call a ghost story romance. Layla moves into the rather desolate Halcyon Beach for the winter, tending a pub during the off-season so that her husband can work on his first novel. We soon see that Layla (at least) finds her relationship with Joel incongruous based on their rather different backgrounds. Joel is a literature professor used to academic circles, whereas Layla is an under-educated barmaid unaccustomed to academia and its trappings. I initially received the impression that Joel was devoted but almost condescendingly protective of Layla and Layla herself seems to suffer from some sort of depression. However, I did not get the impression that either was unhappy in marriage. Over the course of this short novella, we see some pretty significant changes in these two characters and how they relate to each other. I found this quite problematic as the transitions did not feel naturally paced. In a shorter work there are basically less words to travel from ‘A’ to ‘B’, but that doesn’t mean that the journey shouldn’t feel logical. In the case of this novella, Layla seems to fall suddenly in lust with one of the locals completely and willingly ignoring any obligations she might have felt towards her husband. The leap was so sudden and so total that I felt totally lost. Joel seems to rapidly deteriorate towards a disturbed and violent breakdown. I was equally blindsided by this change. One might argue that one character’s transition could cause or influence the other, but in this case they both seem to be reached independently. It’s not that I don’t think either outcome is possible, it’s just that I didn’t feel it progressed in a way I could swallow. 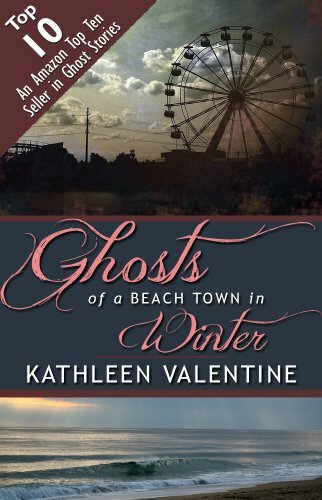 Ghosts of a Beach Town in Winter is also a ghost story. Stories of an ill-fated love long past is slowly revealed to Layla by a small group of locals, affectionately referred to as the ‘geezers’, over the course of the novella. This adds a hint of mystery as the full story is slowly made clear. The idea seems to be that Layla’s encounters with a local echo that of the ill-fated romance, the ghosts of Halcyon Beach reborn through Layla’s indiscretions. The lines between history and present gradually become blurred until a final twist and deliberately ambiguous ending leave the reader pondering. I think the novella is a fairly straightforward ghost story romance that probably needed a little more room to progress the development of our characters from their starting points to their conclusions. I liked the setting and the surrounding characters. Additionally, I liked the gradual revelation of the tragic love story of a circus performer and his forbidden love. I even liked the ending and all it didn’t explicity tell me. However, I think I would have preffered a story with added dimensions – did Layla fall in love with a stranger or did she suffer from romantic delusions provoked by the tales told by the ‘geezers’? Did a merging of past and present provide Layla with the ultimate choice to make to follow her heart or did a progressively worsening depression and delusional fantasy bring her to the brink of disaster? Unfortunately, the way the plot was written there really only ends up being one question to ask – on the final page, did she or didn’t she? If I were to find an audience for this story, I would target those who are romantic in nature – those that can simply enjoy a tragic forbidden love story replayed in the present in a setting which is admittedly quite romantic in its dreariness. However, for me although I think the story had some good ideas and impressive elements, it didn’t quite gel into a totally satisfying whole. This entry was posted in 3, Novella, Reviews, Romance and tagged Romance, Supernatural. Bookmark the permalink.